Condensation or roof leak?? - Roof Menders, Inc.
To control condensation drips, the roof is not an issue! Condensation control is usually a learning curve experience for most metal roof owners. 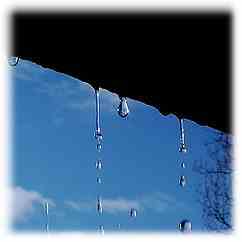 Springtime is usually the end of the season; October is the start of the worst period for condensation drips. Embossed tin shingles rarely encounter that problem due to the many escape routes for moist warm air.